Today's Vegan MoFo prompt is "make/eat something inspired by a book or film." I'm doing something inspired by a TV show. Close enough? Close enough! 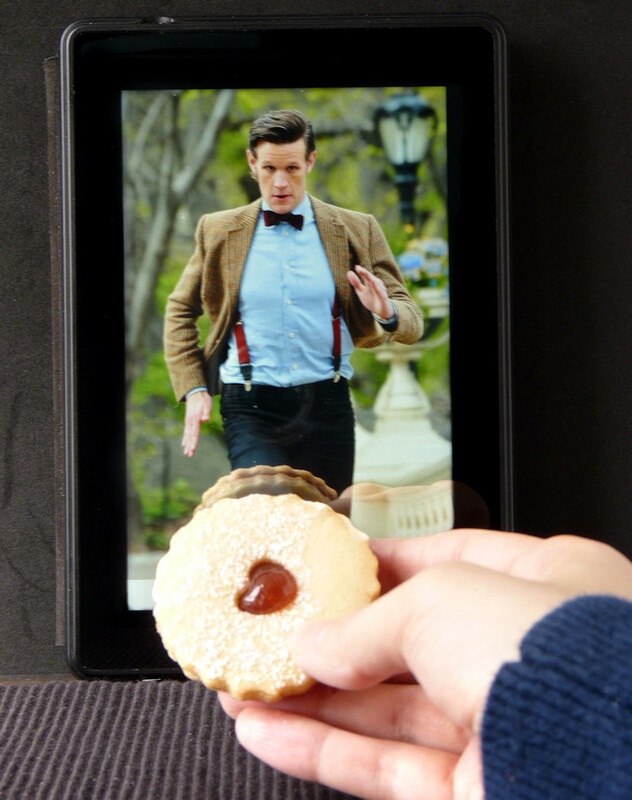 When David Tennant left us I did not think I would like Matt Smith as the Doctor because I'm not good with change, but he was awesome and he brought cookies! I'd say he was fantastic, but that word is reserved for Christopher Eccleston. If you're not a Doctor Who fan, sorry about all that boring stuff I just said up there. 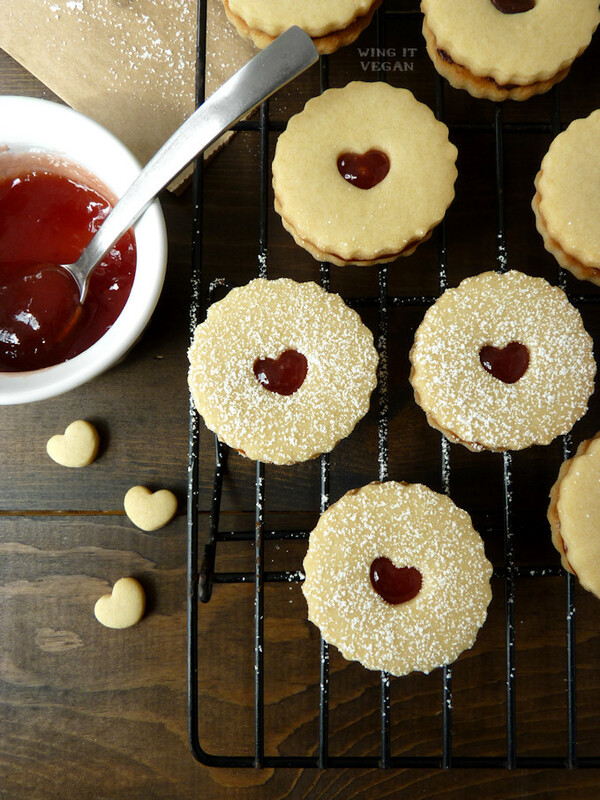 Let me make it up to you with Jammie Dodgers! Aren't they cute? I love them! For those of you who don't watch the show: Three episodes into the fifth series, the Doctor threatens to blow up a Dalek spaceship using a Jammie Dodger as a detonator. Here's a short video of the scene in case you're curious. "All right, it's a Jammie Dodger but I was promised tea!" I used Jamie Oliver's recipe (does that make them Jamie Dodgers instead?) which isn't vegan, but all I had to do was use vegan butter instead or dairy butter and skip the egg yolk. I didn't bother replacing the egg yolk with anything and they turned out perfect. I also skipped the sprinkling of sugar on top. They are sweet and tender and a delicious little treat! 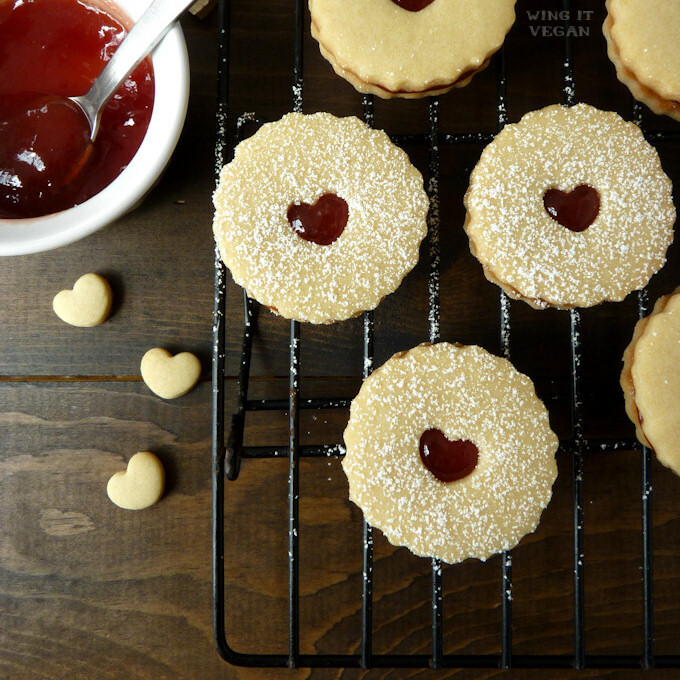 In case you don't know what they are, Jammie Dodgers are a British treat that consists of two shortbread cookies (or biscuits) with a jam filling. He's running toward it! I think he approves! Sorry, Doctor. This one is mine. PS: Oh, for Freedonia's sake! I wanted to make one of them with two hearts but I forgot! Somebody please punch me in the face (of Boe.) Thank you. Perfect looking dodgers. One of my favourite biccies. Also, Mr A is a huge doctor who fan! Love the little hearts left over from the cut outs! 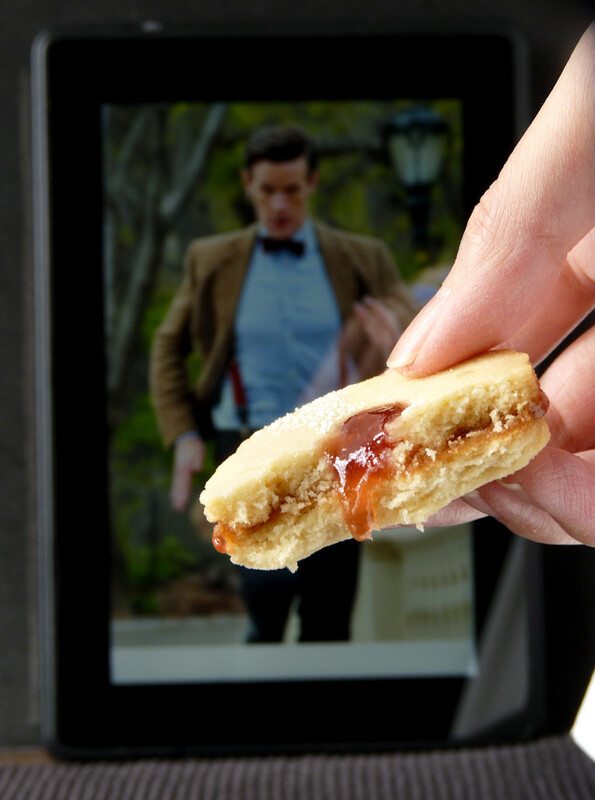 Love the Doctor Who connection for these delicious treats! Tennant forever. <3 And Donna... oh Donna... I will never ever forgive what they did to her. What do you think of Capaldi? I am a bit meh. Brilliant! Your Dodgers are so perfect and neat (my homemade biccies always tend to spread a little and look meh). I hope you left some un-dusted with icing sugar for Mr Wing It (Nah! You should dust them all so there are more for you! He hee!). I'm not a Doctor Who fan (and the current doctor is never going to convert me to being one!) but The Hubster is looking forwards to the new series starting in a couple of weeks. No Boid or backyard critter? Not even a little one? (Can we please have 2 next time to restore the balance of the universe?). Have I not seen this photo of you and the Doctor? Why not? Now I don't know if I remember seeing it or if I just created a picture of you and Matt Smith in my mind. I can totally picture it, but I don't know if you've shared it on your blog before or if I made it up! A bit meh about Capaldi too. And Clara. I am ready for a new Doctor, a new companion, and new stories! Thanks, dude! I was sure mine were going to spread out in the oven and lose their shape. I even forgot to do my one-cookie bake test to see how they did before I baked the entire batch! But all was well in the end. I will be kicking myself for a long time for forgetting to make one with two hearts! Dummy! Matt Smith sort of replaced the customary boid here, but the boids will return soon! I am running out of bird photos, believe it or not. It's time to replenish my stash! hahaha I'm coming over with popcorn and a baseball bat! I've never seen Doctor Who, but so many of my vegan blogger friends love it. So I really need to watch! take care and good luck with all you do.